Each ASP8024-Heritage Edition console is built to order and lovingly constructed in our Hampshire factory by a skilled team who’ve hand-assembled these consoles for over 20 years. 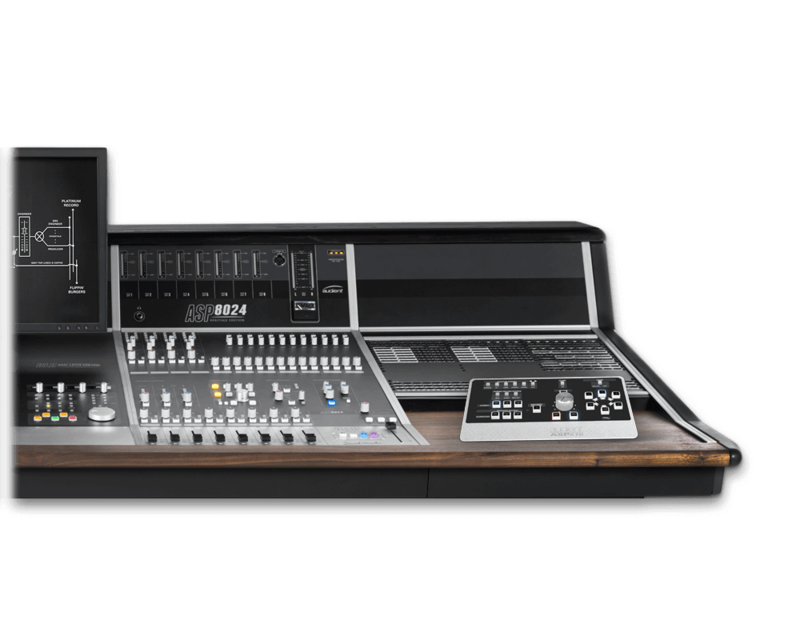 The ASP8024-HE is a semi-modular console, offering you both standard configurations and all manner of bespoke layout possibilities to best suit for your individual recording needs. Depending on the console configuration you choose, the rear connectivity layout may vary due to which modules you select and channel count. For example on a standard console each channel will have a mic input, a line input, tape input and two sends/returns connections, whereas on console with the patchbay module some of these connections will be moved to the patchbay leaving just the mic and line inputs on the channel. Head to our downloads page to view visualisations of various configurations. The heart of every great studio beats with flexible routing. Whilst some clients prefer to create their own remote patchbays (often required for 60-72CH frames) we offer an elegant single module, on-board patchbay for 24, 36 & 48CH consoles - constructed of high-quality Neutrik Bantam TT connectors. Our thoughtfully designed patchbay provides 144 user configurable points for integration of outboard, credenza racks or live room tie lines. These can be through-wired or half-normalled internally if required. The remaining sections provide facility for 2 x 24-track recording machines (Pro Tools & 2” Tape as REC A & REC B for example), all channel i/o including; inserts for Mic / Line & DAW / Tape paths, the entire master section, some spare parallels and even a few level converters! In total 576 points are provided for a 24-channel bay and 768 for a 48-channel bay - if you factor in the equivalent in 19” Bantam types - this equates to 6-8 high quality patchbays typically costing £500 each, so likely costing you between £3000-£5000 before cabling! With the majority of the cabling already inside the console, our patchbay provides an incredible array of workflow options, intuitive installation and will save you not only time but thousands of pounds. It also include is a lovely Walnut script tray - a great place to take session notes! The Producers Desk provides you with extra real estate on your console, letting you to place a keyboard, mouse or even a control surface at the centre of your desk or off to one side for your assistant. This enables you to stay in the sweet spot when working ITB, thus speeding up your workflow and adding to your comfort. Traditionally the producer would sit at the PD to take session notes or annotate music scores alongside the engineer, make it work for you and take advantage of the beautifully included Walnut script tray on this option. You can even have two PD modules side-by-side (what we call a Double-PD) to cater for larger control surfaces such as the Slate Raven or Avid S3 controller. The ASP024-HE is standard fitted with a handmade walnut armrest beautifully crafted by local master joiner Colin from Chipandell. The rich walnut texture adds a touch of class to the console and was added as a nod to vintage consoles of the past. An extended keyboard armrest is also available as an optional extra should you want to place your mouse and keyboard front and centre for improved ergonomics. "Since working as an RAF engineer I have had 20 years of experience working as a joiner and it has been a privilege to work with the ASP8024 creating bespoke armrests"
The standard top trim (180mm) is deep enough to cater for popular speakers such as NS10’s or Auratones but if you have larger frame speakers or a massive collection of lava lamps you can opt for the extended top trim (300mm). This enables you to comfortably and securely place large speakers in an ideal listening position without the need for additional speaker stands. For added strength, the extended top trim option is bracketed to take heavy load bearing weight, and can easily hold 50kg of loudspeaker. Quickly mount any 15-19” TFT screen (max. width 460mm) with our new military grade VESA mount option. We chose this specific mount to reduce the height of the screen, allowing it to sit below the speakers, providing you with better acoustics and improved phantom-centre imaging. Offering both 75 or 100mm VESA mounting standards, our mount enables you to safely and easily adjust the positioning of your screen both horizontally and vertically for complete comfort. This option can be placed above the following modules: producer’s desk, DLC or patchbay. We know that cables are a pain, we know that neat is nice. So we can happily also provide a Cable Entry Meter Pod as an optional extra - such that Ethernet and power to a device such as the Avid S3 can be concealed through the console meterbridge - these can be provided with the VESA option or separately if an alternative screen system is in place. Perfect for big track counts! We know that on the most demanding of tracking sessions you may need more than 24-track bus outputs to record large bands or orchestras with up to 48 channels of discrete source recording. Our 48-Bus Mod takes care of that for you by providing an extra set of multi-track bus combining outputs, forming multi-track buses 25-48. The 48-Bus Mod can be fitted to 36-72CH consoles, but really is a natural fit on a 48CH frame. The 48 Bus Mod can be operated in two modes, Bus Split and Bus Link. In Bus Split mode, channels 1-24 can access multi-track buses 1-24, whilst channels 25+ can access 25-48, providing up to 48 discrete outputs from the console. In Bus Link mode, the 25-48 combiners are summed into the original 1-24 multi-track buses to provide standard 24-bus operation across the entire console. When no bus mod option is installed, the Bus Link switch becomes a handy DFA for those all important production decisions. With the addition of a DB25 connection, the ASP510 easily integrates with the ASP8024-HE providing you with comprehensive monitor control for your 5.1 surround sound system. The ASP510 is the perfect solution for multiple monitor setups, enabling you to switch between three surround sources as well as 3 stereo sources with ease. Please watch our 'Introducing ASP8024-HE' video for ideas and configurations that you might fall love with for your own room, or alternatively please contact us for more information. Download our custom Heritage Edition Sketchup file and use the pre-built modules to create and visualise your perfect console.